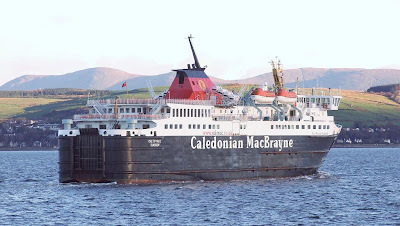 Normally to be found serving the island of Mull from Oban, the appropriately named ferry ISLE OF MULL arrived on the Clyde this morning for her annual drydocking, having been relieved yesterday afternoon by LORD OF THE ISLES. ISLE OF MULL was built at Port Glasgow in 1988, by Appledore Ferguson Shipbuilders, as the yard was known at the time. When new, she suffered from a serious deadweight problem, and this was remedied by inserting a 5.4 metre long section, which increased her length to 90.1 metres. With a gross tonnage of 4,719 tons, she is capable of carrying 951 passengers, and up to 70 cars.